We’d love your help. 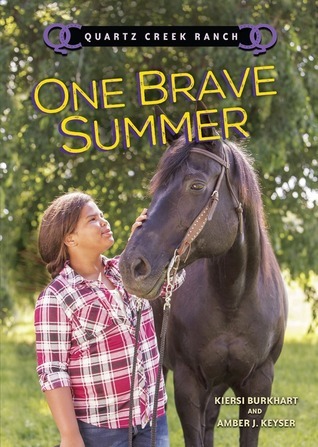 Let us know what’s wrong with this preview of One Brave Summer by Kiersi Burkhart. Paley Dixon is not excited about six weeks on a horse ranch without access to the virtual world of Dragonfyre. In-game, she's the Blue Elf, strong and powerful. In the real world, she's coming off a bad year after moving from Los Angeles to Denver. At least Prince, the majestic horse she's paired with at Quartz Creek Ranch, makes her feel like royalty. To gain Prince's trus Paley Dixon is not excited about six weeks on a horse ranch without access to the virtual world of Dragonfyre. In-game, she's the Blue Elf, strong and powerful. In the real world, she's coming off a bad year after moving from Los Angeles to Denver. At least Prince, the majestic horse she's paired with at Quartz Creek Ranch, makes her feel like royalty. To ask other readers questions about One Brave Summer, please sign up. Paley has been having difficulty making friends and fitting in at her new school. She has retreated into her favorite computer game and her parents are set on stopping it. They send her to a summer ranch camp, where she and several other tweens work on their ability to connect with others. While learning the responsibilities of ranchers, the tweens come across a fossil and must work together to save it from those who would like to steal it. This was a good children's novel. It only bugged me that Paley has been having difficulty making friends and fitting in at her new school. She has retreated into her favorite computer game and her parents are set on stopping it. They send her to a summer ranch camp, where she and several other tweens work on their ability to connect with others. While learning the responsibilities of ranchers, the tweens come across a fossil and must work together to save it from those who would like to steal it. Good story for juvenile horse lovers as well as those struggling with change and friendship issues. Middle schooler Paley has been sent to Quartz Creek Ranch, a summer camp for troubled youth, to help break her addiction to a MMORPG game that has taken over her life. In this quick read, Paley realizes her strengths and gains confidence and lasting friendships. Recommended for older elementary readers, or reluctant teen readers. The prose is easily read, but deals with complex emotions like forgiveness and empathy for those who hurt you. I received this book via Netgalley in exchange for an hone Middle schooler Paley has been sent to Quartz Creek Ranch, a summer camp for troubled youth, to help break her addiction to a MMORPG game that has taken over her life. In this quick read, Paley realizes her strengths and gains confidence and lasting friendships. Kiersi Burkhart lives and works as an author and freelance writer in Wyoming. She grew up a cowgirl in Colorado and can still run the barrel race. Despite owning her own business, she manages to find time to dismantle the patriarchy and play plenty of Pokemon. She lives with her best friend, a mutt named Baby, and her partner at the foot of the mountain.